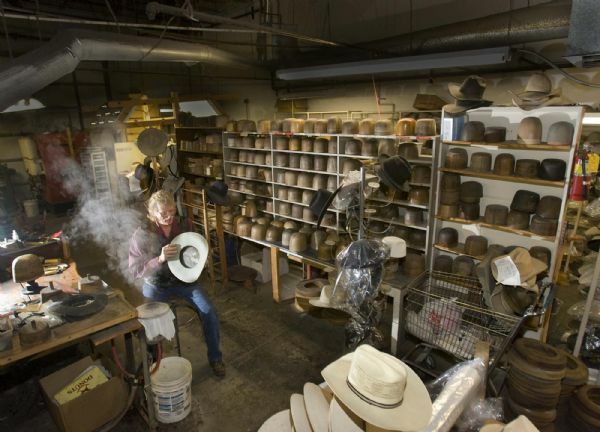 Hat-making » Two Utah shops teach the history of the range, while they craft custom-made cowboy hats. Outdoor types wear the sportsman-style hat. Ranchers don the "Gus," just like the character in "Lonesome Dove." And children like the buckaroo. No matter the style, if it's a custom, Utah-made hat, Jim Whittington of Salt Lake City probably had a hand in making it. For more than two decades, Whittington and his employees at J.W. Hats have made hats for cowboys, ranchers, musicians, poets, tourists and anyone else interested in this classic Western accessory. Each year the business makes between 1,000 and 1,500 new hats, while it cleans or restores hundreds more. But creating the iconic Western head topper is only part of Whittington's reach. The 73-year-old has taught hundreds of people the hat-making craft. Most of his students remain hobbyists, while some have gone on to teach others and a few have started their own businesses. When the latter happens, Whittington usually sells them the blocking table, steamer and other equipment they will need. Whittington's willingness to share his knowledge and expertise has ensured the survival of this art in Utah and beyond, according to Mary Farahnakian, a professor of theater and media arts at Brigham Young University. Each year Farahnakian takes her BYU graduate students to J.W. 's for lessons. The hats that students create are part of the costumes used in plays and musicals on the Provo campus and in the community. "He's always willing to hand down his knowledge," she said. 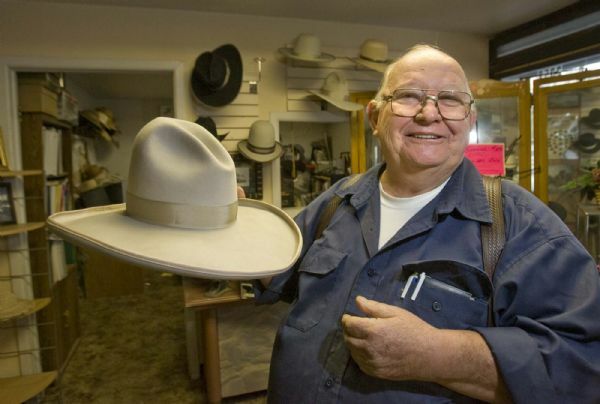 The original hat shop » Whittington, a native of New Mexico, has worn hats all his life. 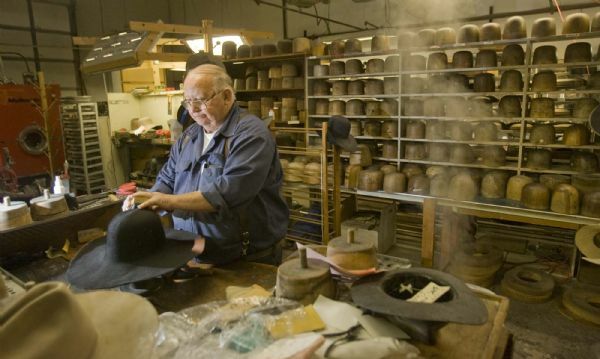 He didn't make it his livelihood until 1986, when he purchased one of the oldest hat-making businesses in the country. Whittington said the business was started in 1853 by Brigham Young and his personal hat-maker, known only as Mr. Tatton. The business stayed in the Tatton family for decades before it was sold to a Jim Smyth. At one point, the owners moved it from Salt Lake City to Draper. It closed for a short time in the 1980s before Whittington purchased the equipment and moved the shop to its current location in a strip mall at 2345 S. Redwood Road. The original wood-blocking table, dating to 1880, is still in use. 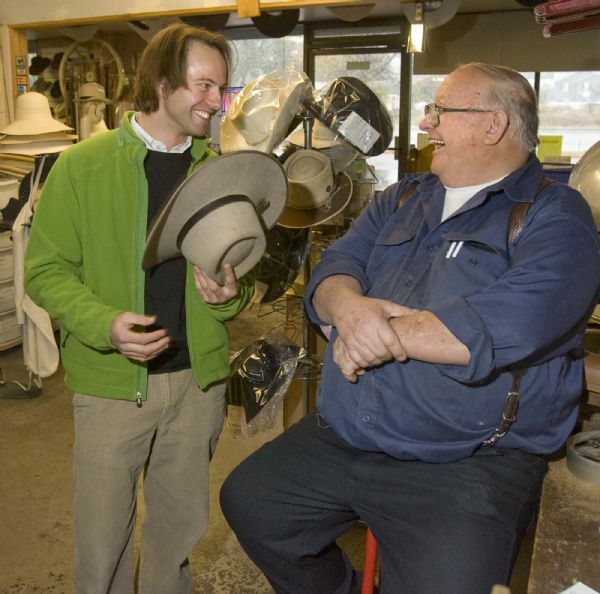 Through the years, Whittington and his employee have made hats for people all over the world. His most famous customer was country singer John Denver, who had plans to design his own line of hats. But before he and Whittington could start producing them, Denver was killed in a plane crash. Whittington never tires of meeting new customers and matching hats with personalities. "I love the challenge, the history, everything about it," he said. Hat history » Cowboy hats are imbedded in American history. They were a necessity, protecting ranchers and farmers from the unyielding desert sun. They also were the impetus for the Western fur trade, says Scott Goodwin, owner of Sevier Valley Hat Company in Richfield. The whole reason the mountain man came out West was for beaver pelts. The hides were shipped back to the East and made into felt for hats, coats and other clothing. "Even back then they knew it was a high-quality fur," said Goodwin, author of the history and how-to-book Cowboy Hat Making Fundamentals . "It wears well, resists moisture and has a nice finish. A beaver-skin hat was the Cadillac of hats." A staple for centuries, hats began to fall out of favor in the early 1960s. Some speculate it occurred after automakers shortened car frames. Men now had to take off their hats to drive. They put them on the passenger seat and inevitably someone would sit on them, ultimately bringing the hat's demise. Recently, hats have made a resurgence. Doctors recommend them to protect against the sun's ultraviolet rays that cause skin cancer. Hollywood and the musical world have turned certain hat styles, like the fedora, into popular fashion statements. While hats can be purchased in all sorts of sporting-goods stores and discount outlets for $20 or $30, a custom-made hat comes at a higher price. Hats made out of 100 percent pure beaver felt can range from $350 to more than $1,000. Those made from a blend of beaver and European hare felt cost about half that. Paying the additional cost, hat-makers say, makes the difference between having a hat you will wear and having one that sits in the closet gathering dust. 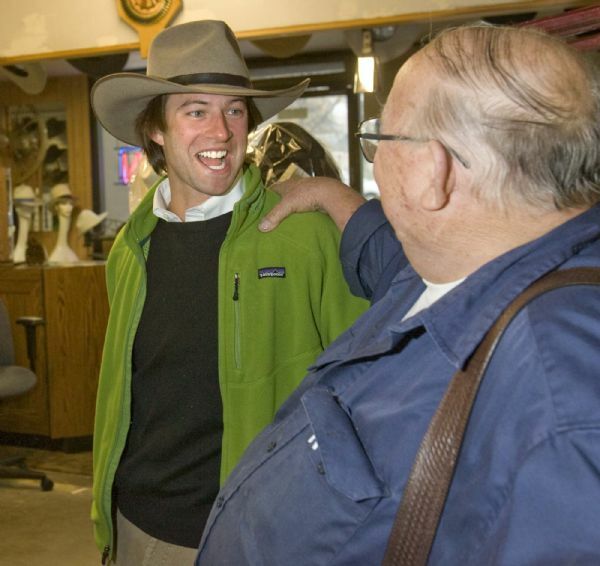 "The main reason to get a custom-made hat is so it won't pinch your head," Goodwin said. "If it's done right, it's something you can wear for years and even pass it on." Seeking the perfect fit is what brought Brad Hutchinson to J.W. Hats. Earlier this year, he purchased a felt hat to wear camping and hiking. The Salt Lake resident and computer programmer was immediately addicted: He subsequently has ordered three more hats for himself and one for his fiancée. "All my hats," he said, "fit like money." You'll see a lot of cowboy hats -- custom-made and store-bought -- at the 15th Annual Heber City's Cowboy Poetry Gathering and Buckaroo Fair, which opens Nov. 3 and runs through Nov. 8, with a lineup of poetry readings, musical and theater performances, Western booths and food. The Buckaroo Fair, Mountain Man Trader's camp and most of the concerts will take place at Wasatch High School, 930 S. 500 East, Heber City. Prices listed below are for tickets purchased at the box office. Tickets purchased online are discounted $2-$6. Nov. 3 » Steak dinner and concert, 5 p.m., Midway Town Hall, 110 W. Main, Midway. Preferred seating, $37; general admission, $27. Nov. 4 » The Wild, Wild West Show, 7 p.m., Wasatch County Events Center, 415 S. Southfield Road, Heber City. Preferred seating, $27; general admission, $22; youth, $12. Barbecue dinner at 5 p.m. Adults, $15; children, $8. Nov. 5 » Cowboy Poetry-Chili Train, 1 p.m., Heber Valley Historic Railroad, 450 S. 600 West, Heber City. Tickets, $27, include lunch starting at 11 a.m.; boarding begins at 12:30 p.m.
Nov. 5 » The Buckaroo Fair, Mountain Man Trader's Camp and continuous music and poetry, 5 to 9 p.m., Wasatch High School. Nov. 5 » Jim Hicks Colt Starting Clinic, 6 p.m., Wasatch County Indoor Arena. $27. Nov. 5 » Michael Martin Murphey and the Utah Valley University Symphony, 7 p.m., Wasatch High School. Preferred seating, $37; general admission, $27. Nov. 5-7 and 12-14 » "Annie Get Your Gun," 7 p.m., Midway Town Hall, 110 W. Main, Midway. Adults, $14; children, $8. Nov. 6 » Cowboy Poetry Express, 9 a.m., Heber Valley Historic Railroad, 450 S. 600 West, Heber City. Tickets, $27, include breakfast. Nov. 6 » The Buckaroo Fair, Mountain Man Trader's Camp and continuous music and poetry, all day, Wasatch High School. Nov. 6 » Asleep at the Wheel and Don Edwards, 1 p.m., Wasatch High School. Preferred seating, $30; general admission, $25. Dinner, $15. Nov. 6 » Sons of the San Joaquin, 4 p.m., Wasatch High School. Preferred seating, $37; general admission, $27. Dinner, $15. Nov. 6 » Homestead hoedown dinner/dance, 6 p.m., Homestead Resort, Midway. $34. Nov. 6 » Riders in the Sky, 7 p.m., Wasatch High School. Preferred seating, $37; general, $27. Dinner, $15. Nov. 6 » Cowboy Buckaroo ball/concert featuring Asleep at the Wheel and Michael Martin Murphey, 9 p.m., Wasatch High School. $22. Nov. 7 » The Buckaroo Fair with continuous music and poetry, all day, Wasatch High School. Nov. 7 » Fiddle/guitar workshops, 10 a.m., Wasatch High School. $10. Nov. 7 » Mountain Valley Extreme Mustang Makeover, Wasatch County Events Center, all day. Includes trial competitions, live auction and adoption of 30 mustangs. Nov. 7 » Bar J Wranglers, 11 a.m., Wasatch High School. Preferred seating, $37; general admission, $27. Dinner, $15. Nov. 7 » Baxter Black, 2 p.m., Wasatch High School. Preferred seating, $37; general, $27. Dinner, $15. Nov. 7 » The Three Amigos featuring Michael Martin Murphey, Don Edwards and Waddie Mitchell, 4:30 p.m., Wasatch High School. Preferred seating, $37; general, $27. Dinner, $15. Nov. 7 » Cowboy buffet and show featuring Hot Club of Cowtown, Sons of the San Joaquin and Jess Howard, 6:30 p.m., Zermatt Resort, Midway. Tickets, $52 per person. Nov. 7 » Bar J Wranglers, 7 p.m., Wasatch High School. Preferred seating, $37; general, $27. Nov 7 » Jam Session, 9 p.m., Claim Jumper, Heber City. $10 cover charge. Nov. 8 » Cowboy Church featuring gospel music by the Bar J Wranglers, Belinda Gail and Curley Musgrave, 3 p.m., Wasatch High School. Free tickets available at Days Market, 435-654-2352, or at the door. Donations for charity will be collected. "Following the Vaquero" is a series of six feature-length documentaries about the Spanish horsemen known as vaqueros, who arrived in the west more than four centuries ago with the conquistadors. These horsemen from the Iberian Peninsula sat on their high stepping caballos (horses) and skillfully managed the wild cattle on the open range. They were the genesis of the American cowboy. Where » Wasatch High School, 930 S. 500 East, Heber City. Admission » Free with admission to the Buckaroo Fair, $10-$12. Show times » Nov. 6: 11 a.m., "Tapadero -- The California Vaquero." 2:30 p.m., "The Remuda -- Great Basin Buckaroo." 5:30 p.m., "Holo Holo Paniolo -- Hawaiian Cowboy." Nov. 7: 11 a.m., "Houlihan -- Northern Range Cowboy." 2:30 p.m., "Tierra Encantada -- New Mexico Cowboys." 5:30 p.m., "Los Primeros -- The First Vaqueros."